The Legislature is in the final days of the 105-day regular session, which often means most of the negotiations take place outside public view. In particular, as we wrote in yesterday’s newsletter, resolving the differences between the House- and Senate-passed operating budgets poses potential difficult challenges. The challenges will be met, of course, and most likely without the extended special sessions we’ve seen in past years. In The Lens, TJ Martinell writes that House committees have approved a capital gains income tax and voted to continue to study the state tax structure. The same week a 2014 legal memo to the Seattle City council regarding a proposed “millionaire’s tax” was released, the House Finance Committee voted on April 19 to advance a bill creating a capital gains income tax to pay for education. HB 2156 would impose a 9.9 percent tax on the income derived from long-term capital gains and direct the revenue stream to the Education Legacy Trust account. The bill would also restructure the real estate excise tax (REET) from its current 1.28 flat rate to a graduated rate. For some capital gains tax critics, the proposal is viewed as an effort to overturn the state constitution’s prohibition on a progressive income tax. Although the bill refers to it as an excise tax, the tax’s actual definition of capital gains is “the net long-term capital gain reportable for federal income tax purposes. Further cementing the belief by some tax analysts that the bill is meant to trigger a lawsuit was the rejection by the committee of a proposed amendment to HB 2156 that would have prohibited the state attorney general from asking the State Supreme Court to consider the constitutional issue regarding income as property…. Also, the oft-studied state tax structure would be the subject of continued analysis under a bill passed by the House Appropriations Committee. But as The Lens reports, there’s more. The House Appropriations Committee voted on April 22 after a public hearing to advance a bill that makes changes to the state tax structure and extends the life of a state tax structure work group. Among the changes made by HB 2157 sponsored by Rep. Gael Tarleton (D-36) is an increase to the preferential business and occupation (B&O) tax rate for travel agents and tour operators from 0.275 percent to 0.9 percent, though a provision eliminating the preferential B&O rate for precious metals and bullion was removed prior to the committee vote. For all the focus on tax policy changes – most of which are designed to raise taxes – the Association of Washington Business reminds us that the public shows little interest in new or increased taxes. We understate a bit, as the poll graphic below shows. The survey reveals a major divide between the general public and lawmakers in Olympia who are debating whether to raise more than $1 billion in new and higher taxes at a time when the state is already experiencing remarkable revenue growth. It’s likely to be a busy couple of days in Olympia. 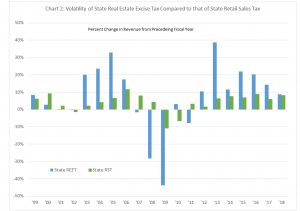 A new analysis by the Washington Research Council demonstrates the volatility of a graduated real estate excise tax as is currently being considered in Olympia. The 2019-21 operating budgets passed by the House and the Senate both assume more revenue than is forecasted to be available from current sources. In both cases, budget writers suggest that part of the gap be filled by replacing the current flat rate (1.28 percent) Real Estate Excise Tax (REET) with a graduated rate structure. This would reduce the tax paid on lower valued properties, increase the tax paid on higher valued properties and raise more revenue overall. The existing REET is a volatile tax; a graduated REET would be even more volatile. The WRC compared the volatility of the REET with that of the retail sales tax in a series of charts, one of which is shown below. Exacerbating the problem of volatility, neither graduated REET proposal fully directs its revenue to the general fund, where it would be counted as general state revenue and thus be subject to the constitutional provisions regarding transfers to the BSA. The House bill directs 55.5 percent of the additional revenue generated by its graduated REET to the Education Legacy Trust Account (ELTA), where it would not count as general state revenue. The Senate bill directs about 90 percent of the additional revenue to ELTA. These proposals would make the state’s general fund less sustainable for the future. The WRC previous pointed out that another revenue source under consideration, the capital gains tax, would pose a similar sustainability problem. Analysis: House and Senate budgets “fall short” of meeting sustainability test. The Washington Research Council has released a detailed analysis of the biennial state budgets passed by the House and Senate. (A side-by-side comparison was released earlier.) With just over a week to go in the regular legislative session, reconciling the differences between the two budgets is one of the remaining major challenges confronting lawmakers. Washington’s recent run of strong state revenue growth won’t last forever. 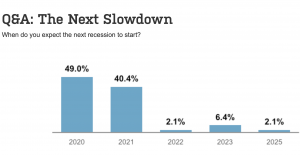 Indeed, the Economic and Revenue Forecast Council expects revenues to grow more slowly in the coming years, and many economists expect a recession sometime in the four-year budget window. With that in mind, the Legislature should carefully consider whether proposed spending levels are sustainable and build adequate reserves. Yesterday, we urged readers to contact their legislators and ask them to tap the brakes on spending. The WRC report underscores the importance of that request. State revenues from current sources are estimated to reach $50.555 billion in 2019–21, enough to cover the 2019–21 maintenance level (the cost of continuing current services). On top of the maintenance level, the House has passed a 2019–21 operating budget that would increase appropriations by $2.421 billion from funds subject to the outlook and the Senate has passed a budget that would increase appropriations by $1.697 billion. To fund the new policy spending, the House would impose a capital gains tax, and both the House and Senate would change the real estate excise tax so its rate is graduated and increase taxes by repealing tax preferences (the state’s term for exemptions, exclusions, deductions, deferrals, credits, and preferential rates). Some of the major spending items in both budgets include school employee health benefits and the collective bargaining agreements with state employees. Substantial increases would also be made in human services. The proposed spending increases are historically large at 19 percent in the House and 17 percent in the Senate. They rank among the highest spending increases of the last 25 years. Given the likelihood of an economic downturn, the Legislature should carefully consider whether this level of spending is sustainable and build adequate reserves. Those on our mailing list will have received an “action alert” from us earlier today. It’s important. So we’re also sharing it on the blog. The message will be familiar to those who have followed our coverage of state budget developments. Washington’s long-running economic recovery and expansion has resulted in unprecedented growth. State spending in Washington grew $11 billion in the last four years. State lawmakers have leveraged this good fortune to make investments in important programs. But they haven’t paid commensurate attention to preparing for an inevitable downturn. 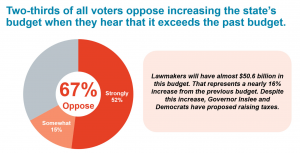 Now, many want to increase spending even further and fund that expansion with tax increases. Meanwhile, experts are warning we should be preparing for the potential of a slowing national economy. Please take one minute to email lawmakers now! Click the link for more detail. And then, please, contact your legislator. Time is short. Washingtonians think the state Legislature should be able to write a budget without imposing new taxes, according to a new DHM survey commissioned by the Association of Washington Business. 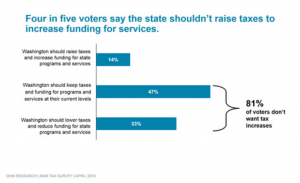 As the chart below taken from the AWB blog post shows, when informed of growth in the state budget, two-thirds of those polled oppose new taxes. State revenues have increased dramatically on the strength of Washington’s robust economic recovery from the recession. The March forecast added $861 million to the mix. Yet, budgets proposed by the House, Governor, and Senate all include new taxes. Spending has also increased at a heady clip, up 44 percent in the last decade. That’s before the increases being proposed this session for the coming biennium. The statewide survey of 608 Washington voters was commissioned by the Association of Washington Business and conducted April 4-9 by DHM Research. It has margin of error of plus or minus 4%. Click through for other survey results. The voters overwhelmingly answer in the affirmative. It’s enough. The Economic and Revenue Forecast Council has released its latest monthly report. It continues to reflect the state’s generally healthy economy, while sending some cautious signals. We have just one month of new Washington employment data since the March forecast was released. Total nonfarm payroll employment rose 14,300 (seasonally adjusted) in March after a revised 5,300 decline in February. The March forecast expected an increase of 6,200 jobs in March. The strong job growth in March was probably influenced by unusu- ally severe weather in February. The construction sector added 4,500 jobs in March after losing 4,200 jobs in February. Private services-providing sectors added 8,000 jobs in March. The manufacturing sector added 200 jobs and government employment increased by 1,500 jobs. Washington’s unemployment rate edged up to 4.6% in March from 4.5% in February. The rate remains near the all-time low 4.4% first reached last June. The reason for the slight uptick since June is that while employment has continued to grow, the labor force has grown even faster. After a strong fourth quarter, housing construction weakened in early 2019. The rear-view mirror confirms that the state has been through good times. whole (see figure). The difference between Washington and U.S. personal income and GDP growth was mostly due to two sectors: retail trade (which includes electronic shopping) and information (which includes software publishing and other IT services such as internet publishing and web search portals). Revenues continue to come in at a healthy rate. Major General Fund-State (GF-S) revenue collections for the March 11 – April 10, 2019 collection period came in $13.9 million (1.0%) above the March forecast. Revenue Act tax receipts were $62,000 (0.0%) lower than forecasted while all other receipts came in $14.0 million (7.1%) higher than forecasted. So far so good. Yet, it’s worth remembering that the latest monthly report from the Wall Street Journal’s survey of economists finds half of them projecting a recession next year. Time to be cautious about future commitments. Stateline examines per capita income data to compare states economic performance. Washington, unsurprisingly, is shown to have enjoyed a solid run. 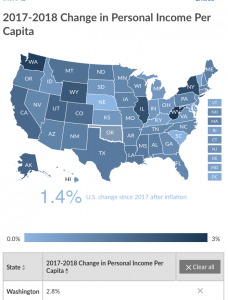 The map below shows Washington’s 2.8 percent increase in PCPI is twice the nation’s 1.4 percent increase from 2017 to 2018. Yet, we’re dealing with growth from a weak base. Washington’s growth is particularly impressive given that our state has long ranked among the nation’s leading economic performers. 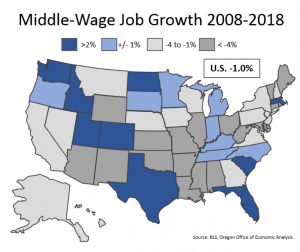 The Oregon Office of Economic Analysis also has a good report on middle-wage jobs. The nation’s largest metro areas turned around first after the recession and have seen the strongest gains overall. Given that many middle-wage jobs are in part driven by population growth, the fact that the big cities have seen the best employment and population gains means they are also more likely to recover their middle-wage jobs. Now, many of the nation’s secondary metros and rural areas are growing again — at least here in Oregon and across the West — but their overall gains are less pronounced than the big urban centers over the past decade. The report includes this map, showing Washington’s middle-wage job growth to be among the nation’s most robust. These estimates suggest real GDP growth will be around 2% annualized in Q1. Again, we think a cautious approach to state budgeting makes sense. While it’s tempting to assume that the strong decade of revenue growth will continue unabated, experience tells us otherwise.